Translation- and interpreting-related blogs are more frequent than one expects, trust me: they’re just the web’s best kept secret! Twitter has undoubtely become a life saver and an invaluable tool for doing just that: searching and be searched. But before talking about the main topic, I have to start with a preamble. After only 2 days the interview went live on Aldo’s blog, I have been literally inundated by odd requests for tips and… employment. Yes, I know very well that visibility (and spam) is part of being constantly exposed on the Internet, and I always welcome CVs and enquiries, but THESE requests were somewhat ‘peculiar’. Apart from being surprised, I also felt terrible for the job market situation in my native country – which is indeed dreadful. Having said that, unfortunately, I don’t feel in the position to work with people based on a random non-translation-related yet remarkable skill, nor to give away tips on how to go and live abroad – because my business is, as you know… translations! IMHO, I strongly believe that a) professionally speaking, one needs a solid university background in translation and/or interpreting or equivalent valuable experience and b) on how to move and work abroad, all I can say (apart from the usual tips everybody can find browsing the web) is that it’s something you learn on the way, while doing it (at least in my experience). Some sort of: book a flight, leave everything behind and try it for youself. In this framework, today I happened to come across the webpage of the Translation Journal and was delighted by the post below – also mentioned in the title – because it reminds me of this ‘random-request-for-work’ experience I’ve just had to deal with. Take a sober inventory of what you still need to acquire. Then acquire it. Spend some time on training first—it need not be in translation as such—specialty fields are just as important for many. Allow yourself some time abroad; read, read, read; and listen, listen, listen. Seek out colleagues wherever you can. Good places to look are Internet “hangouts” for translators and (yes) translators’ associations. Collaborate whenever you have a chance. Edit and be edited, even if you hate editing. Above all, keep your mind open. Think of yourself as a businessperson first and foremost. Be dependable. Be available. Be visible. Be serious. Market yourself. Stick to deadlines religiously. Don’t guess what your customer needs—if you aren’t 100% sure, ask. If you don’t like what you hear, say no. If you are called upon to do something you cannot do, say no. But if you do engage in a contract, abide by its terms. Click here for the entire content. I thought these tips are more than worth sharing,… thanks Per! I’ve always loved drawing but then the passion for languages took over somehow and even though my Art teacher was all excited about the possibility my parents would agree to send me to an artistic high school, that never happened and… you know what I did instead. Unfortunately, I was extremely good at reproducing still natures and portraits – pretty classic, in the end – but never put my back into comics. The ones I am in love with right now are from The Oatmeal, a very cunning, extra funny website who will keep you entertained for hours and hours. I’ll go back to that in a sec. If you cannot wait, click here now! But let’s keep on track… the title: how do you write e-mails? E-mails are tricky, and especially in a business environment, good e-mail writing skills are certainly a plus. 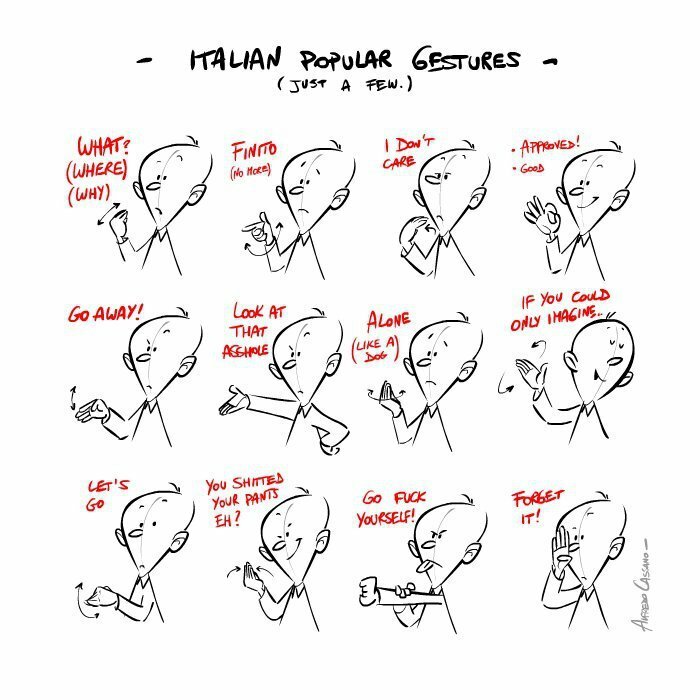 Everybody knows that Italy’s peculiar in all its aspects (one for all: its Prime Minister…). 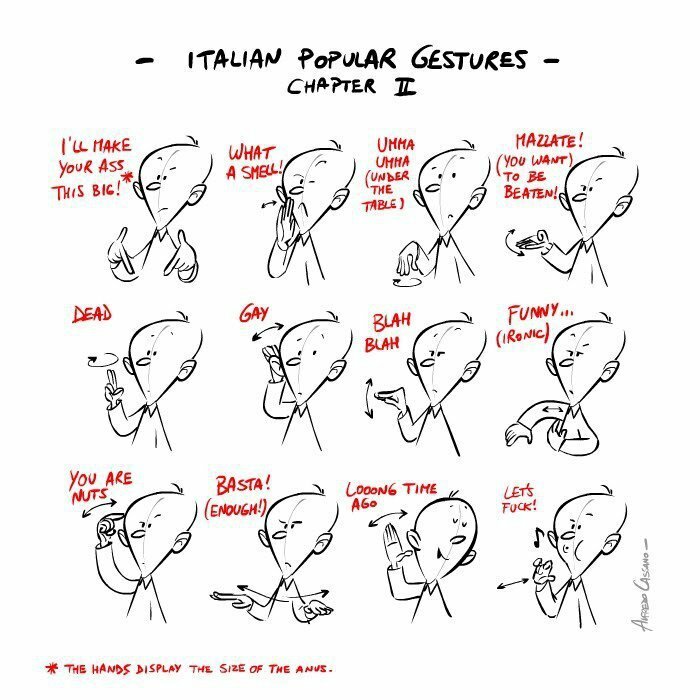 But what is more typical and cultural-bound than Italian gestures? As I said, time ticks by and well, I now know it’s a good thing, that your culture is innerly what you are. 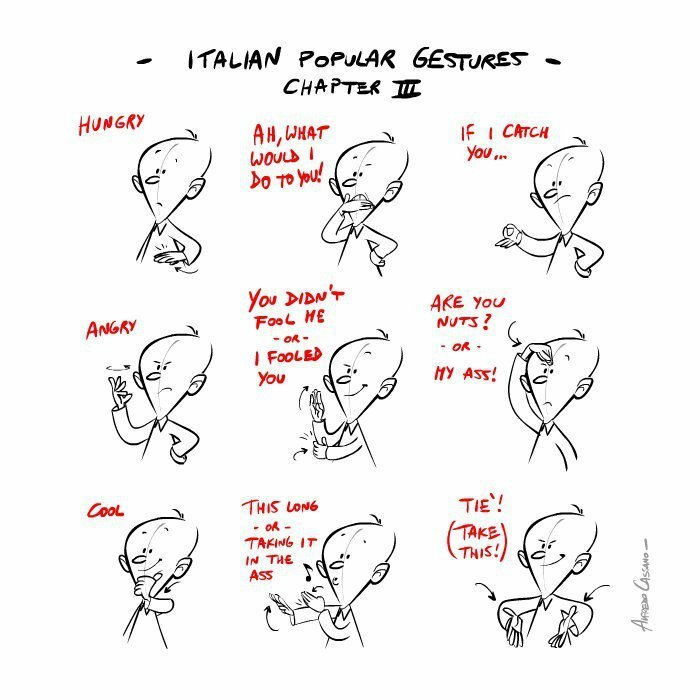 Now I get to appreciate the fact that one can truly remain Italian (or English or French or Danish and so on and so forth) even when away from the homeland for long time. And that it’s something you need to be proud of. Hence, my post. These pictures are not totally ‘politically correct’ and possibly not very elegant (mild swearing is involved) but I did find them funny and fairly true….